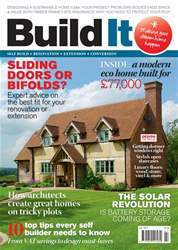 We have been reading Build It magazine for several months and are finding it very interesting and useful for our upcoming project. My husband John and I are just about to embark on a scheme, along with our son, and are expecting to submit plans within the next few weeks. We hope to renovate and extend a 1950s house near Colchester in Essex, aspiring to as high a level of insulation and airtightness as we can achieve. Other sustainable features include solar panels and rainwater harvesting, while an electric car will complete our new lifestyle. It is a modest development compared to many, but a once in a lifetime experience for us.